Analytics is a branch of the mathematical discipline of data analysis. It involves the study of historical data to uncover meaningful trends and patterns to help users understand the effect of certain decisions or actions, or to evaluate the performance of certain machines or processes. The key strength of analytics is the use of data visualization to display trends, effects, and results. 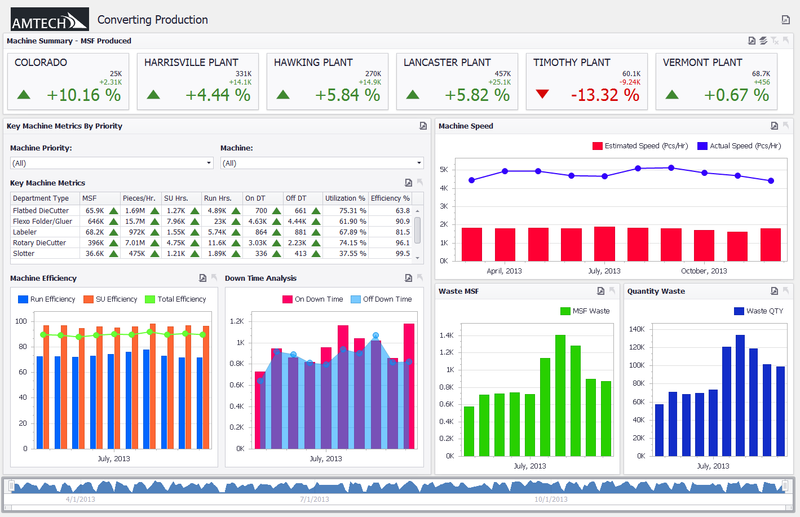 In the example above, inside one concise graphic layout you can see the month- to-month (MTM) or year-to-year (YTY) change in an individual plant’s volume, trends in machine utilization, changes in efficiency and downtime reported, as well as a host of other data points.